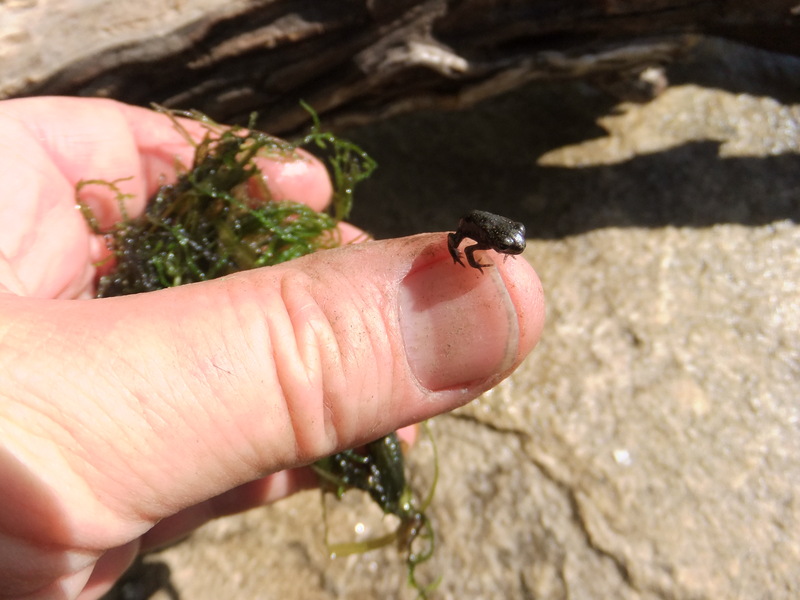 Most of the toad tadpoles that were laid April 4 are still tadpoles but a couple that are in a heated aquarium have completely changed (see, I avoided spelling metamorphisized or somethin like that) into tiny little toads. I put them outside because there is no way I can provide live insects to such small creatures. I am sure their mortality rate is still very high but at least they have made it this far, so good luck little dudes! A few weeks ago I had a female Red Swordtail in a 10 gallon tank where she could have her first brood of babies. She is a young fish and I was not expecting very many little ones. 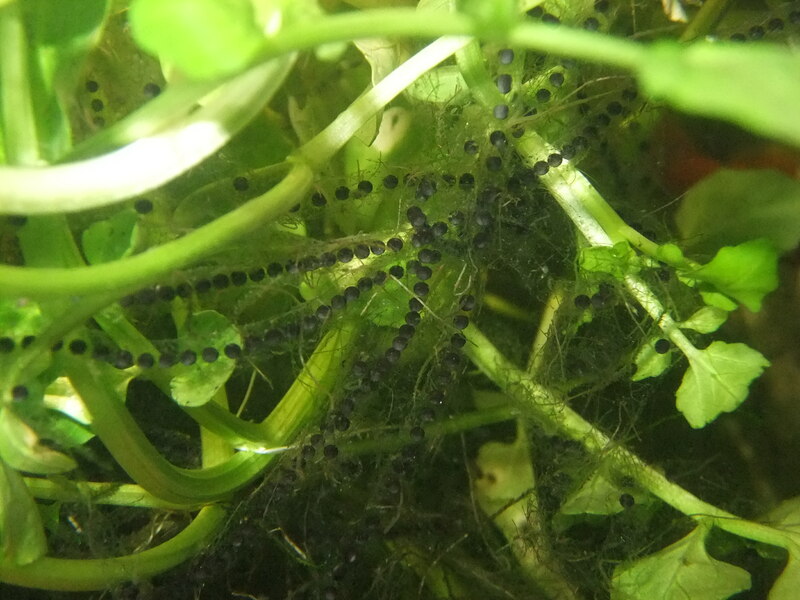 Well, then came the “toad rescue” and the toad eggs, and I left the momma Swordtail with the toad eggs. 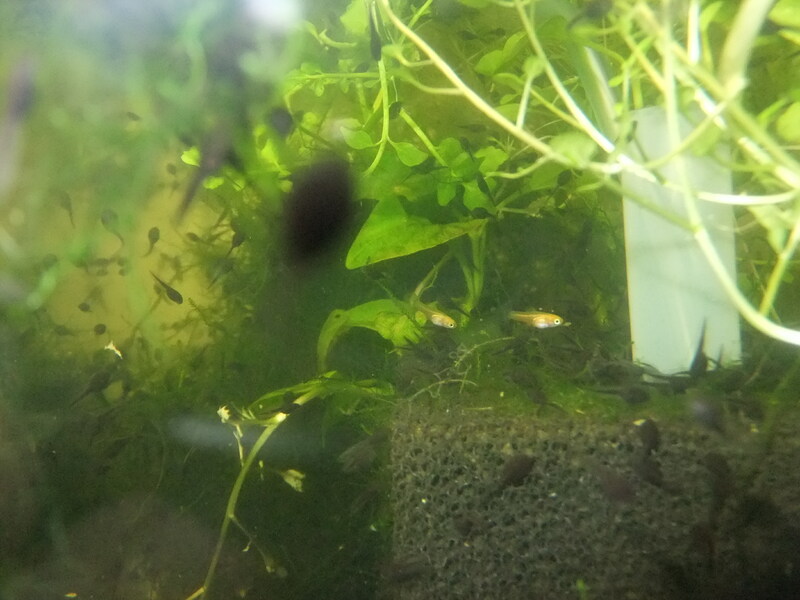 This tank of a gazillion tadpoles now has some baby Swordtails in it. I have only counted four but you can get a colony of Swordtails going from just a few fish. 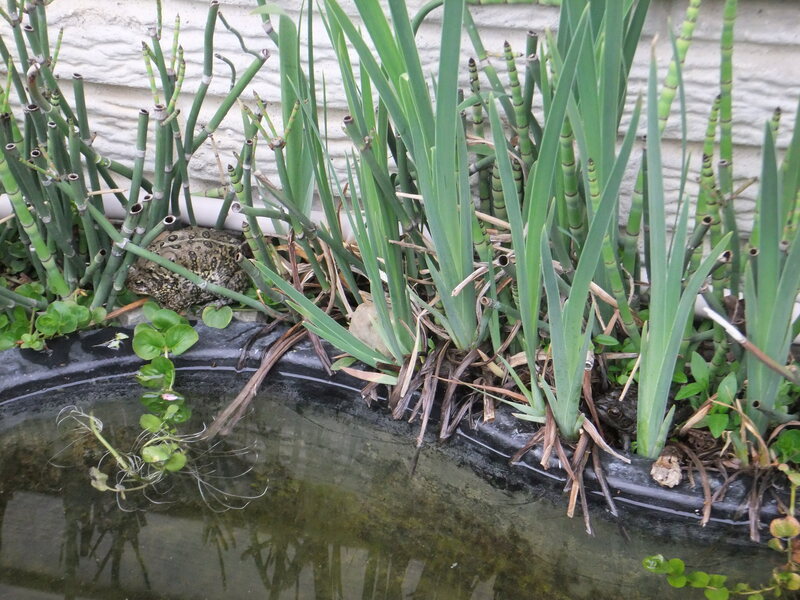 I’m thrilled to see these four and hope to move them outdoors after it warms to the point where my little pond stays above 70F degrees. "Are we gonna turn into frogs, too?" We had a rainy night and a warm blast of air. The toads started singing and this morning a pair were “making out” by the little pond. 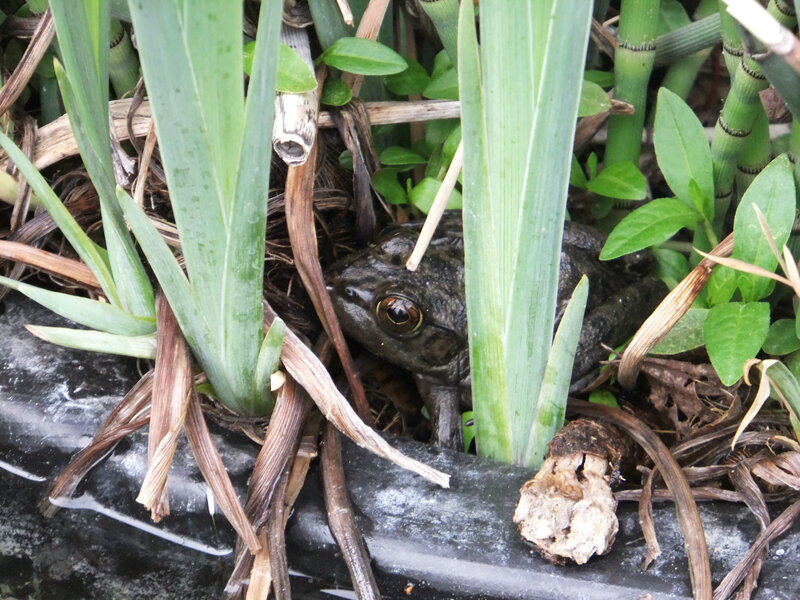 Also, a little Bullfrog was nestled in the plants. You can see both the toads and the Bullfrog. 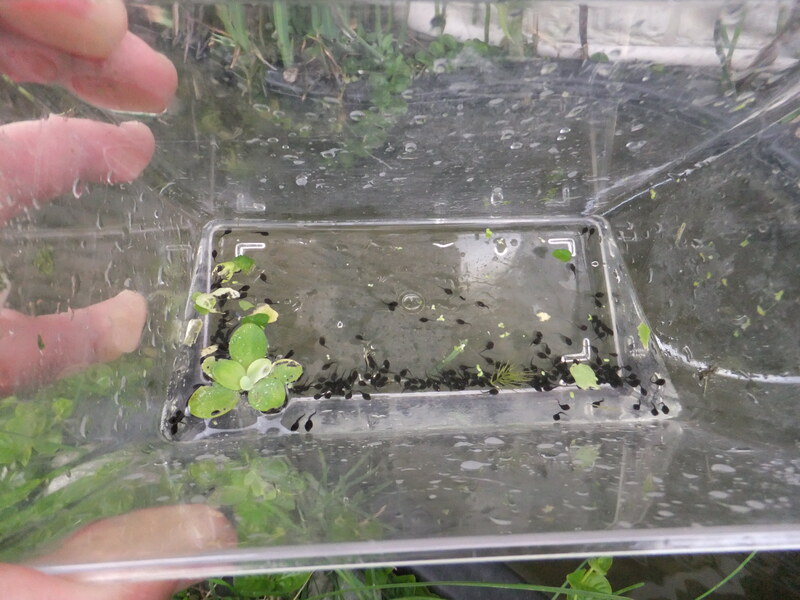 Since it is so warm, I scooped up a few (about 100) toad tadpoles and released them into the 30 gallon pond. The aquarium they were in is about 68F, and the pond is 64F. I have been giving away a few tadpoles to my co-workers who have young children, and also one young lady took some to a school. Still, I have about 1500 tadpoles to go! I love this wet Spring weather, so good for the amphibians, and ducks. At first I thought these toads had laid 300 eggs, then I saw 600 tadpoles hatching, then I thought there might be 1000, then a day later I knew there were over 1500 and now I can say there may be 2000 tadpoles in this 10 gallon tank. I have been pouring in a quart of green water (algae) from the turtle pond and sprinkling in some Hikari First Bites, a finely ground fish food for baby fish. As soon as we get past this cold spell of 30 degree (minus 1 Celsius) nights I will put the tadpoles into the 30-gallon outdoor pond. Just like that, Toad eggs! 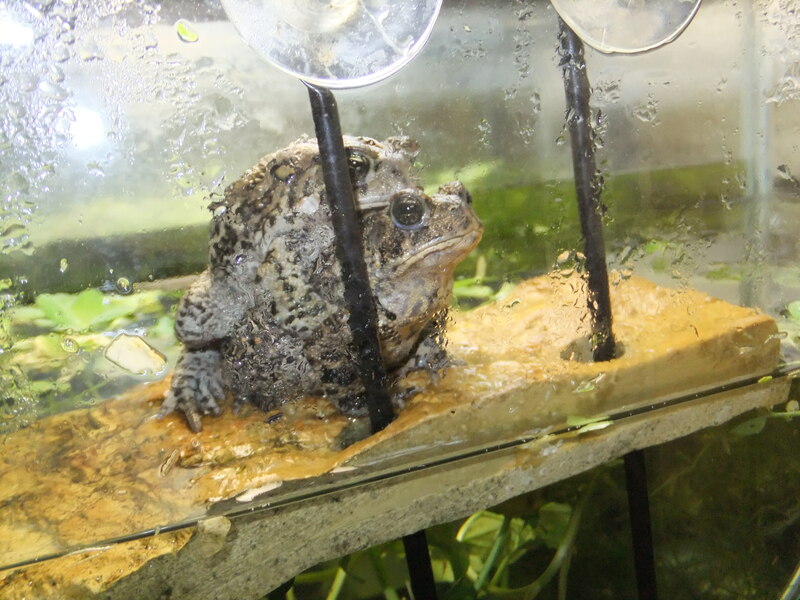 I put a pair of the rescued toads (see previous post) into a 10 gallon tank last night. The tank is about half full of water, with various aquatic plants floating around. I actually had it set up for the female Red Swordtail to have her babies. 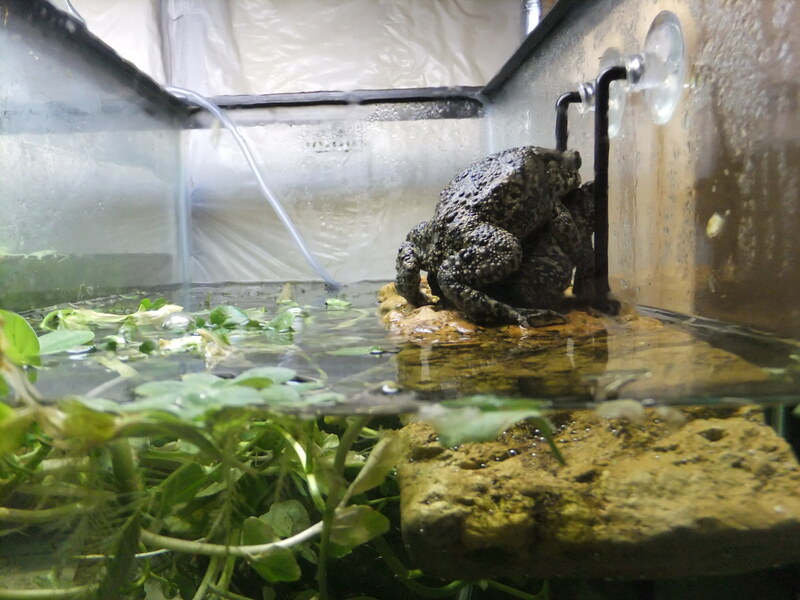 I added a floating platform for the toads to sit on. This morning the male is calling and calling. 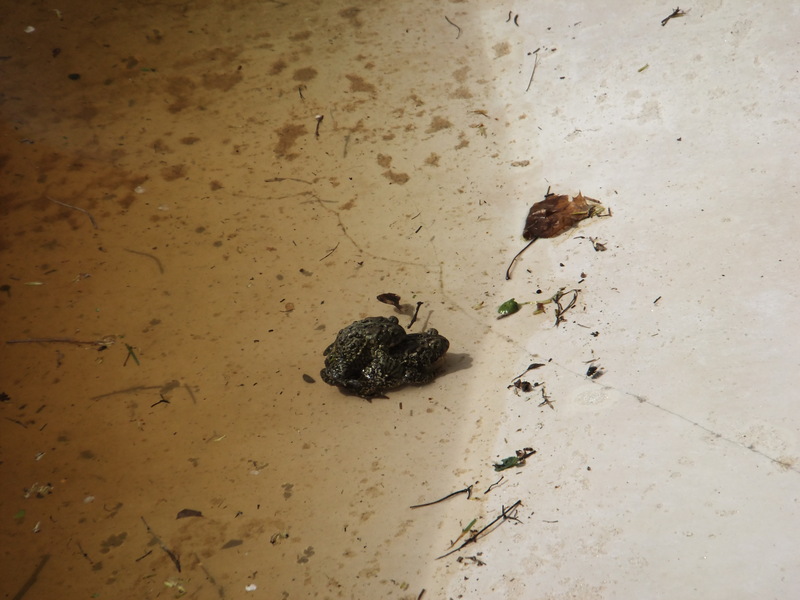 My wife asked, ” Did you put those toads in the basement?” Well, yes dear, one pair, just for a few days. It only took one night. Here are the eggs. They are the little black things laid in a string. I read that the eggs will hatch in 3 days to 2 weeks depending on temperature. The fish tank is much warmer than the outside water temperature so I hope they will hatch very soon, then I will transfer the tadpoles to the outdoor 30 gallon pond. Some friends bought a house with an in-ground pool. The pool needs work and the repairs will start in a few days. Right now there is about 2 feet of nasty water and leaves in the bottom of this pool. A bunch of toads have moved in to breed. In fact, they must hear the calls of the first toads who found the pool and then they come to edge and fall in. Quite a drop, probably 5 feet or so. Here's a pair along the water's edge. These toads were easy to catch since they were quite occupied. 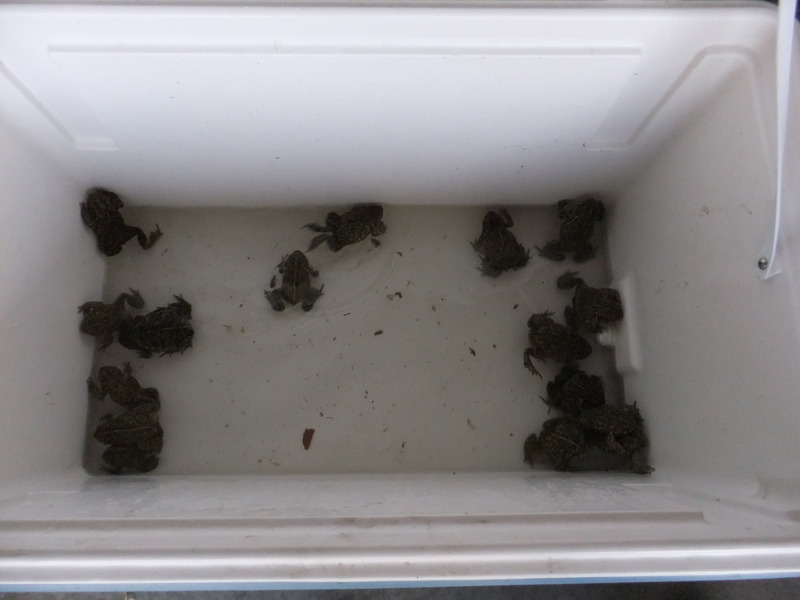 I ended up with 19 toads. My wife was thrilled that I used our picnic cooler. These are all Bufo americanus, the American Toad. I put one pair in a half-filled aquarium. Soon they will be back outside. 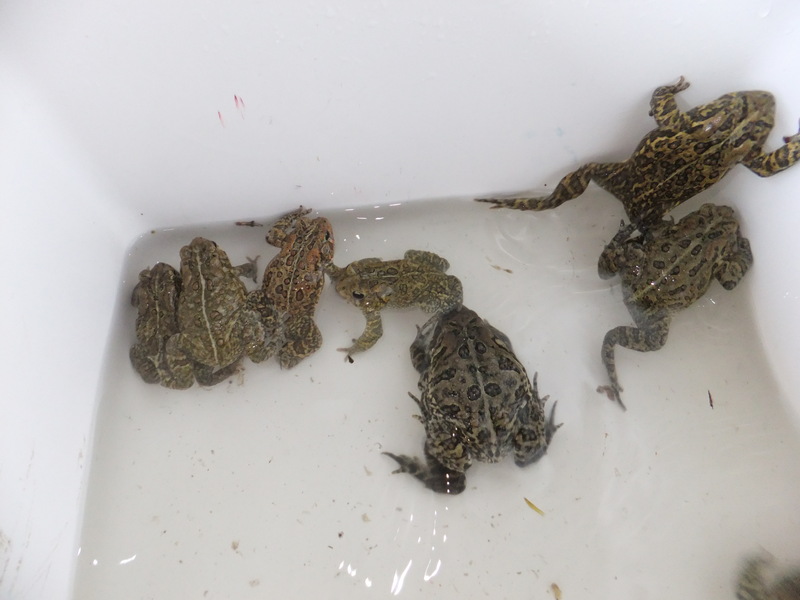 All of the toads will get good homes, there are plenty of wild places where I can release them. My round-trip to get these toads was 75 miles. Ten bucks in gas equals about 50 cents per toad. Well worth it! 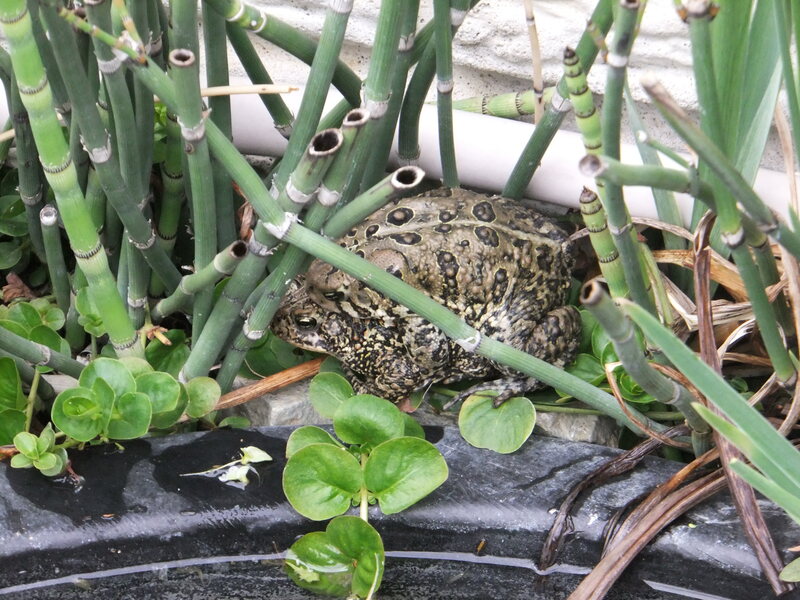 Until the mid 1980’s, we would see toads around our homes in the early evening. Now I hardly ever see one.